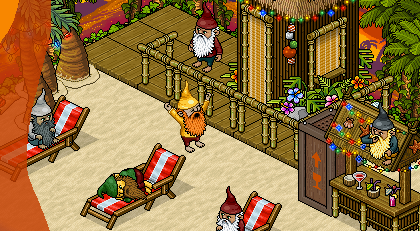 ﻿ Habbo Credits Collectors Get Invaded by Gnomes this Week! Your one stop best place to see a review on your desired games! Habbo Credits Collectors Get Invaded by Gnomes this Week! The 15th birthday celebration for Habbo Hotel may still be in full swing, but the Gnomes are not going to let it stop them from conquering the world. This week, collectors of Habbo Credits and furni can band together to push back the small but terrible invasion. That or get the creepy little things as pets. The Gnomes are Invading! Team up with other Habbos to fight the surging tide of creepy little Gnomes out to conquer the world. This multi-mission event spanning the globe has been going on for a couple of weeks now. To stop the Gnomes, players must reach their factory in Antarctica. However, before they can assault this Gnome stronghold, they must first liberate the rest of the world from the bearded menace. This week, players need to free North America from Gnome oppression. Players will have to go to San Francisco and wipe out any Gnome presence there! Succeed and be part in the liberation of the world to earn sweet badges! Gnomes are trying to get into the hotel one way or another. And since their hostile methods seem to be not working out much, they are trying another method – getting in as pets. Currently available from the shop for 20 coins, Gnome in a box, is an item players can purchase. Placing the box in your room and opening it will give you a random Gnome pet. They can be trained like other pets and have a level that goes from 1 to 20. Training them allows them to learn more commands. You can also scratch them to make them more obedient to you. Why you want these creepy little things as pet however is a complete mystery. The nasty little Gnomes are not just invading the world, they are starting to creep into the minds of Habbos. In a recent competition, players were asked to submit the nastiest Gnome Pixel art they can make. Fifteen players with twisted minds received a gold-plated Hippo furni along with a badge for their creepy creations. Click here to view the list of winners and their works. I Want to Make Albion Online Gold Now!